A step-by-step guide on how to construct market segments is provided below. However, there are a number of relevant topic discussions on the marketing study guide which may be beneficial for you. These topics are included in the side bar menu and in related topics at the bottom of this page. Depending upon your segmentation task you may need just to complete steps one to three below, or you may need steps one to six – so check what is required first. The first step in creating market segments is to clearly define the market of interest. As discussed in the markets, sub-markets and product-markets section, it is important not to define a market too broadly. For instance, let’s assume that you are looking to segment the market for a firm that operates a chain of book stores. It would be too top-level and too awkward to define the market as all retailing consumers, as it is unlikely to lead to any meaningful segmentation. As shown in the following diagram, we need to split out the overall broad market (retailing) into its various sub-markets (such as, supermarkets, specialty stores and so on). We can also further define some of these sub-markets (if they are still too broad) as is shown for specialty stores below. And finally, we need to determine the market’s geographic boundaries. It this case a list of possibilities has been provided in the figure. Let’s pick the UK; so our defined product/market is book retailers in the UK. Now that we have defined the product/market clearly (which we will refer to as ‘the market’ from this point on), we need to determine what types (segments) of different consumers form that overall market. 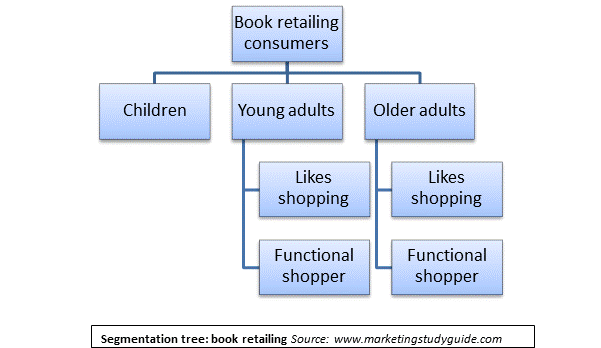 To do this, we need to review the list of segmentation bases/variables and choose two or three of those variables that we think (or know from market research) affect the purchasing behavior of book consumers. Note: When segmenting a business market, please see segmentation bases for business markets instead of the above link. For this market, let’s pick three different variables from the list, as per the following table. These particular segmentation variables have been chosen as they are likely to influence the purchasing behavior of books and, therefore, should lead to the identification of interesting segments. Now we have chosen the segmentation variables, we can use a segmentation tree structure to help map out the segments, as shown below. Other examples for segmentation trees can be found in how is market segmentation actually undertaken. As you can see, five different segments have been created by applying these segmentation variables. In the first stage, a broad demographic split has been used (to create children, young adults and older adults segment). The two adult segments then have a behavior variable applied to them (whether they enjoy shopping or just like to get in and out quickly). Remember that are many ways to segment the same market. Provided that the segmentation variables have some logic to them, most outcomes should be quite acceptable. Please see the article on market segmentation examples, as well as the list of market segment ideas. Now that we have developed some market segments we may be required to evaluate them to ensure that they are useable and logical. This would happen in a real-life firm, but it may not form part of your particular task. To do this, you need to quickly assess the segments against a checklist of factors. This is discussed in more detail in criteria for effective segmentation. Basically, all that is required is to list the evaluation criteria and to provide a supporting comment, as is demonstrated in the following table. If, on occasion, the segments that you have created don’t appear to meet the evaluation criteria, then simply revisit step two and change the segmentation variables that you have selected. You may be required to describe the segments (develop a segment profile). The following is a checklist of factors that you might consider. For some of these items below you may not know actually – in that case either make a logical assumption or do not include the factor in the segment profile. Remember that the task here is to describe and understand the segments a little more. An example of how to complete this table is shown in segment profiles. If you are required to select one target market from you list of market segments, then you need to use some form of objective assessment. Again, this topic is covered in detail in how are target markets selected, but as a quick guide you should use some of the following factors in assessing the attractiveness of each market segment. Using the assessment information you have just constructed, you can select the most appropriate target market for the firm. While there are many factors to consider, you should at least take into account: the firm’s strategy, the attractiveness of the segment, the competitive rivalry of the segment, and the firm’s ability to successfully compete.